In a wonderful wedding day, every bride wants to bethe most charming princess, fascinating thousands of sight. But what to do, or thin, weak, if your hair is not enough for a chic hairstyles, they are too short and do not have time to grow back the wedding? For these girls the ideal solution would be a wedding hairstyle with false locks. Additional locks are easy to use, give hair density, length, of this volume is easy to make any favorite hairstyle. When choosing overhead strands of the basis is yourconventional natural hair color. To hairstyle looked organically, locks must be of the same shade. To do this, take a strand of the invoice and attach to your hair. If you can see clearly the difference, the color you will not do. If you do not want to do such a long andtroublesome procedures like hair extensions for a wedding day, then simply purchase false locks. Rim locks are divided into artificial and natural. 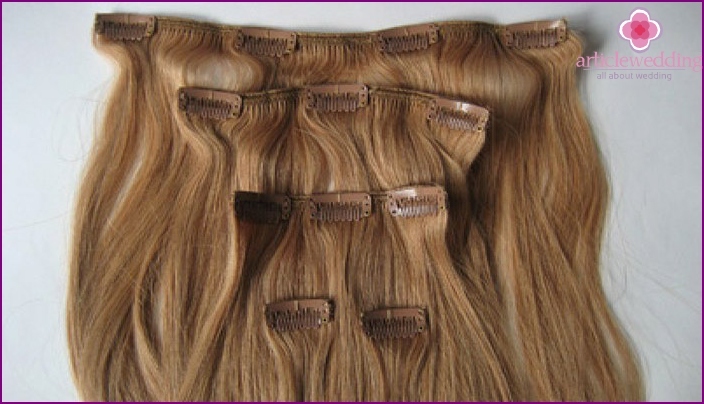 Natural false locks at the price of more expensive, but it is more practical to use. Of these, you can simulate any type of hair, until the loose hair curled, and they will not be anything different from your own. 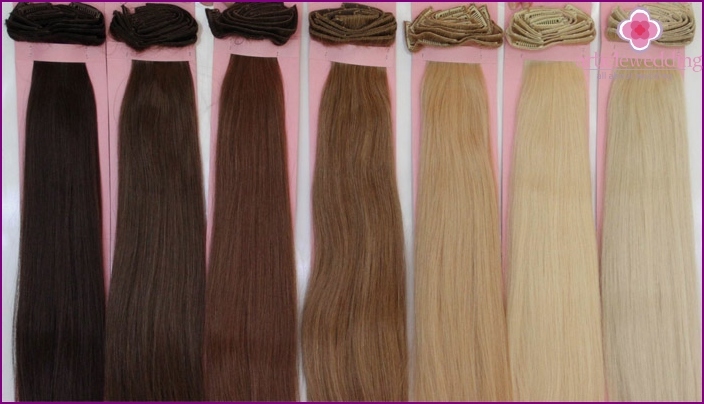 Natural overhead strands loosely painted in any color, perfectly clean and curl, which can not be said about artificial. By weight the natural overhead strands of artificial harder, so it is not recommended to use more than four pieces at a time, so as not to burden their own volosy.Dlya fashionistas who dream about a romantic wedding hair in long loose curls, fit only natural strands. This hairstyle will give the impression of excellent health and beauty of the hair of its owner. Well look woven into her delicate flowers. But, creating a lush head of hair, take care so that it blends in well with your natural rare bangs. Choose natural overhead strands with nesechenymi tips, brilliant, alive. The thickness of the top and bottom should be the same. If the budget does not allow to buy naturalstrands, then encourage you to choose artificial. You can safely buy them, if you want to make a pony, which requires a large amount of hair. For curly hairstyle with curls it is better to acquire Curly locks overhead as artificial very naughty, they are wound, in addition, they may melt under the curling. Note that the artificial strand will be more shine than your own hair. Pick up straight or curly strands of artificial overhead, given the type of the chosen hairstyle. Recommended pre-consult the hairdresser and decide what overhead cooperate for you to purchase. In the hands of a master, they will help to create a true masterpiece! The retro style has become fashionable in all areasour lives. Not bypassed it and wedding fashion. Hair style retro always original, luxurious, fit well under the wedding dress. Simple, but very elegant, which came from the 60-ies of the last century, Babette finds its fans and in the XXI century. There are many variations of this hairstyle, but the main focus is on the volume at the crown and nape, created using a roller, fleece, gently frame the face, hanging locks. Babette Hair strands with patch looks like with bangs and without it. It looks great with a wedding veil, tiara, or decorated with flowers. Also interesting wedding retro hairstyle in which the bangs and the top part of the hair is cleaned up, fixed or barrette beautiful flowers, and the lower portion is slightly curled, tease. A similar version of her styling - or barrettecolors are assigned to the bangs and bangs with the rest of the hair on the temples curled in light curls. It has long been familiar to all, but this does not become less popular hairstyle shell, made with false locks, is very well suited to a beautiful wedding dress. Yet it is called the French beam. There is a lot of daring interpretations of classical shell: it can be put at the back, on the top, side, and even diagonally. If you have overhead locks it is possibleleave the shells fired from the tail, curled his light waves. To create a romantic image of the bride in the face light curls left. Hairstyle makes a longer neck, thinner, from which it becomes slimmer silhouette. Curls are very popular, they are presentwhile creating 90% of wedding hairstyles. Rim locks are placed in different ways, of which simulate a huge number of not similar to each other hairstyles, both classical and asymmetric (side curls, long curls, Hollywood style), using the classic and original partings. For beautiful curls perm usually used on large curlers. The perfect complement to them will spit, ribbons, barrettes, flowers. Classic is always current, so ifupdo love, do not give up on them on their wedding day. In combination with bare shoulders, beautiful neckline high laying of overhead strands make you queen. It should be natural, so do not use bouffant and a large number of varnish. Curls framing the face of the girl gentle waves, give it a special elegant, romantic look. They are suitable for all women, combine well with any wedding dress. Curls are made only from natural overhead strands fixed with nail, hair dryer. Wedding hairstyle of braid strands with patch,decorated with a variety of intricate tangles, emphasize the innocence, grace the bride, her good taste. 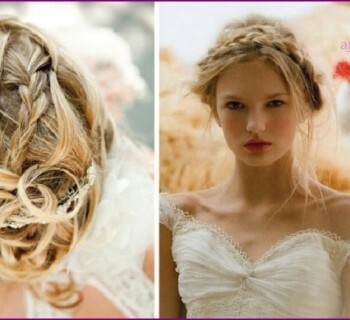 Perfectly complemented by an image woven into braids with ribbons, strings of pearls, live or artificial flowers. There are many ways to weave the braid strands overhead, simple and very complex, the bride will choose the suitable option for themselves. The advantage of such a netting is that itmuch stronger than the unruly curls, preserved for a long time under any weather conditions. Fatou is better to choose a transparent or attach it below the hair, so she did not hide beautifully arranged patterns. Hairstyle voluminous bundle of strands with patch -very elegant hairstyle, perfectly combined with a veil, beautiful lace, flowers. Hair matched up from the face and shoulders, firmly fixed on the back of the head with the help of pins, clamps, silicone rubber bands, tape, ribbon, and other accessories. With such a hairstyle much to gain open shoulders, neck and décolleté area. When using an overhead beam strands smooth out volume, beautiful. The beam can decorate weaving, from that, he will only become more beautiful. It can be neatly, tightly assembled, and can be careless, free. Also popular is low, the fallen beam collected on the back of the head, or a bundle, laid a flower. Held high beams with beautiful curly tresses falling down. There is a large array of hairstyles in Greekstyle with overhead strands, which curls and braids weave intricate patterns, fit into the beautiful drawings on the back of his head. Braids can be tight or loose, there is a lot of room for imagination, they are attached with beautiful hairpins, invisible. All this creation is decorated with a tiara or flowers. This hairstyle looks perfect with false locks, because the more volume, the more kinds of tangles, you can build. It is extremely useful for creating a wedding hairstyle will be overhead strands barrette (clips). How do they look, shown in the photo. It is recommended to buy natural overheadstrands. They are easy to clean, painted and stacked in the same way as your own. Wedding hairstyles using convenient overhead strands barrette can create a Greek braids with a variety of weaves and curls, or in the form of loose curls. How does the master see in the video. Examples evening hairstyles, made with the help of overhead strands barrette, look at the photo below. Also, to extend the hair, give them volume, you can use artificial hairpiece. Here are the hairstyles such.